This quilt is intended for Joshua - who I call Jo-Jo. It was started in September 2006 during our annual Queensland holiday. It is all hand pieced. 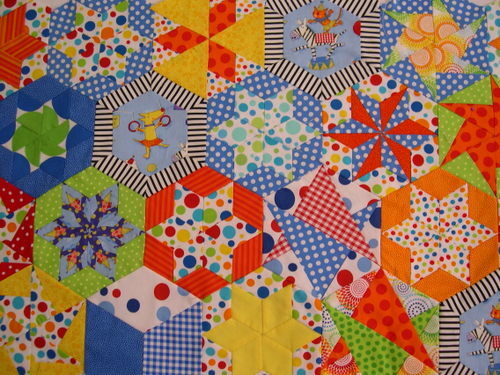 It is based on a quilt from Quilters Companion No.18 'Candied Hexagons' by Kerry Dear. All of the blocks are complete. I have only to put it all together and do the applique on the borders - which I have designed myself.